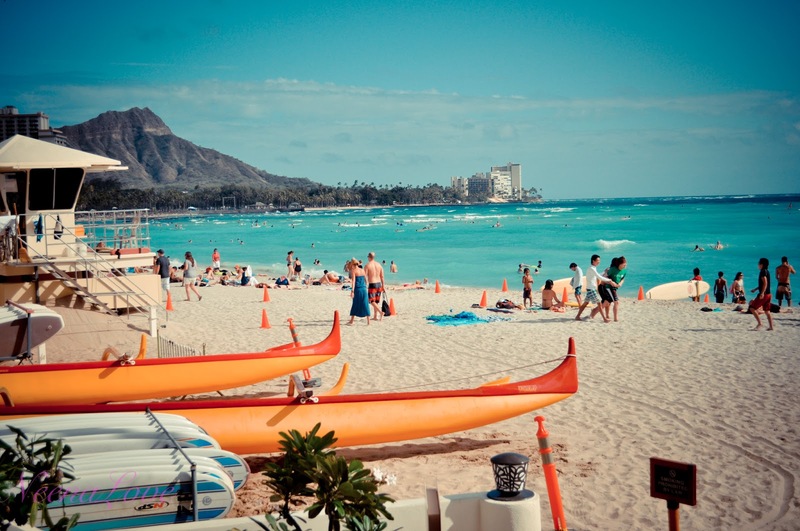 Who says Waikiki is only for tourists? 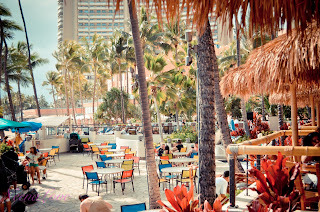 **giggles** For the most part, I agree that Waikiki is not the funnest place for locals but it definitely has some great places to hang out at. 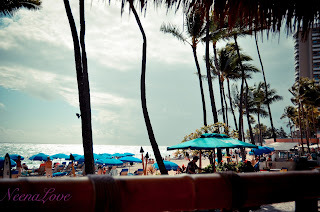 The decision to head out to Waikiki belongs to my husband. Our decision to go to Dukes Waikiki belongs to my ride-or-die cousin-slash-sister, Mahealani (a former employee of Dukes). We were supposed to get on a catamaran today but the wind was whipping and was too much for the catamarans. We had planned on getting on the sunset sail, which departs Waikiki Beach at 5pm'ish and docks about 2-3 miles out for 90 minutes or so. The weather was not in our favor to get on the catamaran but was still very beautiful! 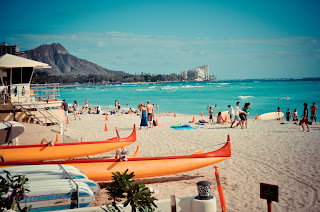 So we didn't make it on the catamaran but we enjoyed a beautiful afternoon on Waikiki Beach. See pictures and captions at the bottom. I am not sure if there are any recent developments regarding the serious legal battle over who owns the legally trademarked name and image of Duke Kahanamoku. For those unfamiliar with Duke and the legal battles, click here for a 2006 article that appeared in The Honolulu Magazine regarding Duke and the fight over the trademark. This United States of America Legal System approach to the rights of its citizens makes no concessions for a person's ignorance of the law and how to navigate it. With the complexities of the legal system's administrative rules, an individual has a difficult time navigating the courts and this flows over into trademark issues like the Duke fiasco. Ultimately, the legal system is biased to be in favor of the claimant with the most money and the most outrageous legal team. There are very few underdogs that are in it for the long haul. Either one runs out of money to see it through and thus loses the lawyers or just don't have the endurance to see it allllll the way through. It is probably a combination of both. 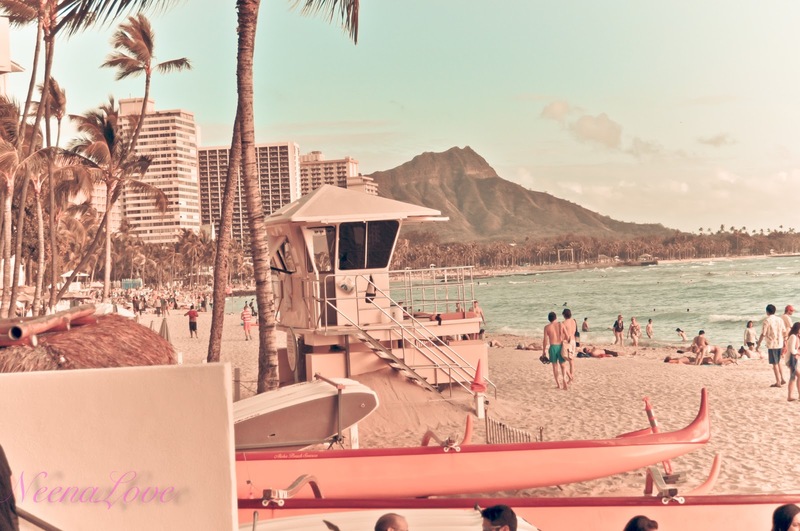 Dukes Waikiki is located directly on Waikiki Beach. Depending on the time and weather, you can catch a gorgeous Hawaiian sunset. The colors and hues in the sky is truly one to behold. The restaurant features dark wood walls. There are dark tables and chairs that are all very neat and orderly. The bar area boasts a beautiful bartop and gorgeous views. The decor is exactly what a tourist would desire to see in a Hawaiian setting. In the busy rush during dinner and night cap drinking, the restaurant is bustling and loud. 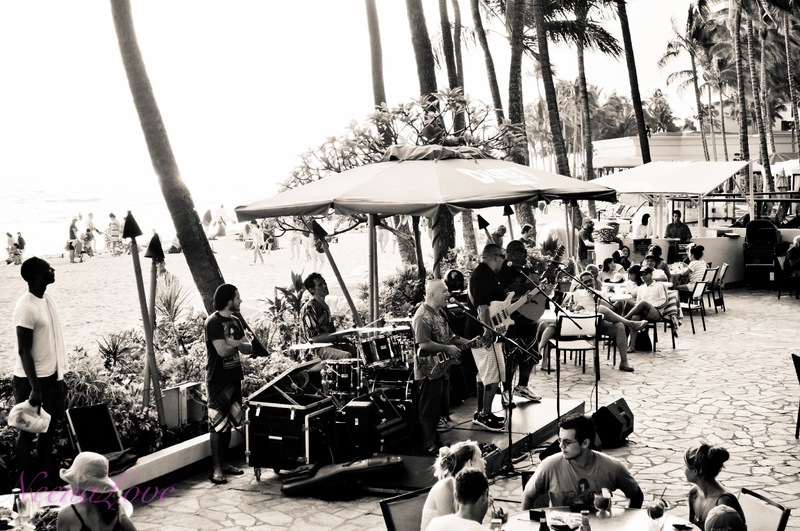 On the weekends, the evenings feature live music. Sundays are reserved for 70's Hawai'i icon, Henry Kapono, who has enjoyed a comeback in recent years. 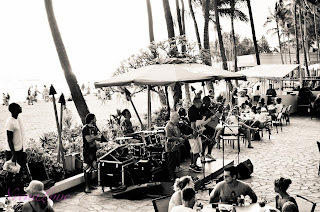 Our visit to Dukes Waikiki featured Sean Na'auao and friends from 4-6pm. Sean Na'auao did very little singing but traded off playing the electric bass and acoustic guitar. The true star was a band member that showed up maybe 30-45 minutes late. When he got to the gig, boy did the music change. The group, surprisingly, covered Musiq Soulchild's Just Friends, which is one of my faves. They had a nice mix of contemporary R&B and Adult Pop, some stuff from the 80's. They covered some Maroon 5 hits, lots of Bob Marley and Alpha Blondy, Journey, The Eagles. I was very impressed with the cover list. They even covered Waterfalls by TLC. It would have been really nice to see Sean perform some Hawaiian numbers. 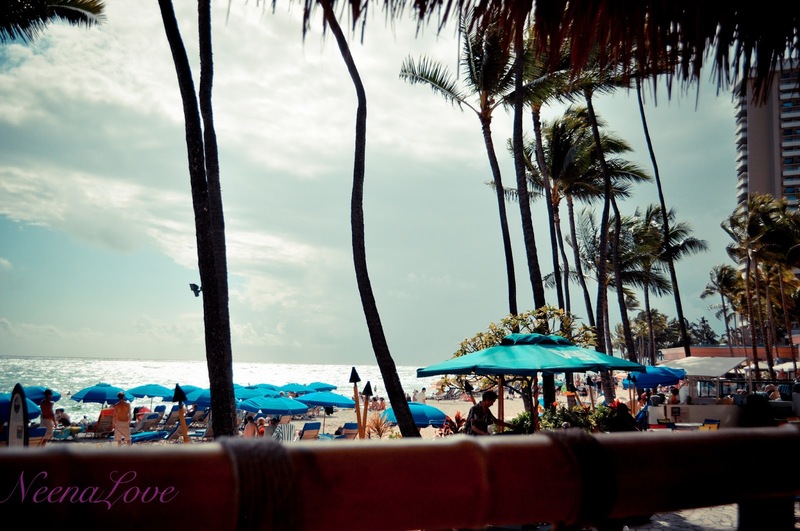 It is always so beautiful to hear the language of Hawai'i. 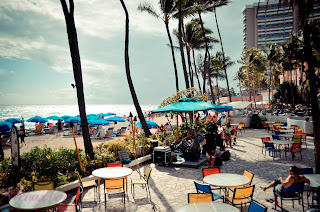 I have to say that EVERY single time I have visited Dukes Waikiki, I have been met with excellent service! You will be treated as if you were the one and only customer in the restaurant. I love going there for the service and we always tip generously. Breakfast - Dukes Waikiki offers a breakfast buffet that features regular breakfast items. This is NOT upscale eating. This is just a normal breakfast buffet that you could probably find in Waffle Houses across America but better quality. Lunch - The food on the bar side is also their lunch menu. It is average bar fare: burgers, nachos, waffle fries, caesar salad, etc. Dinner - Dinner features a full service salad bar that is complimentary to every meal. The appetizers are always a hit. Their dinner menu changes based on the fresh-caught fish. If I remember correctly, they have a few staples on their dinner menu. The value for this area is definitely the ambiance (more than the food). Good luck with parking. 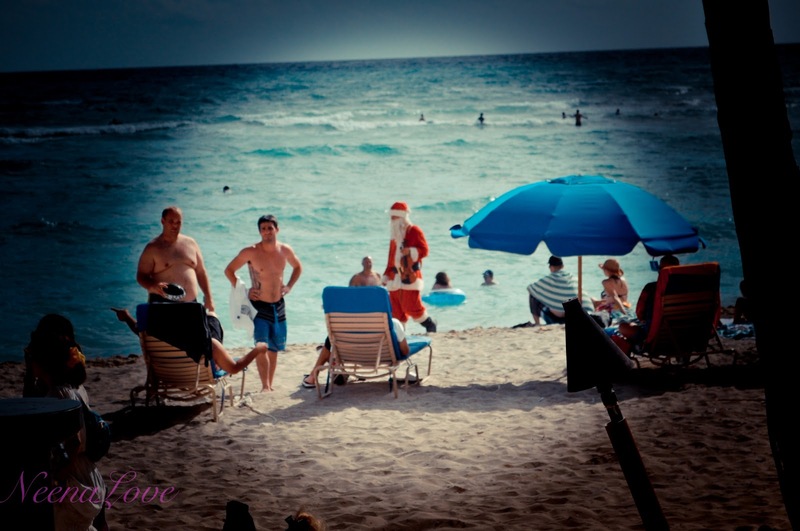 They offer 2-hour validated parking at Outrigger East. I took these pictures on such a beautiful afternoon. I edited some to mimic old pictures with a vintage feel. These are indeed my own personal photos so I would appreciate it if you get written permission from me before using the photos. 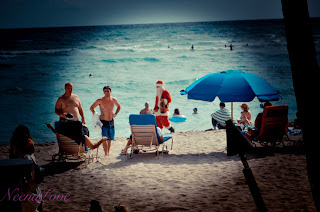 Email me for written permission and instructions on using the photos or any content from this blog. This was my view in front of me. This view was behind me. Total throwback to postcards from yesteryear. They played beautiful music at a wonderful setting. Santa Claus showed up. I could not stop laughing! The roof hut is a touch of the tropics. 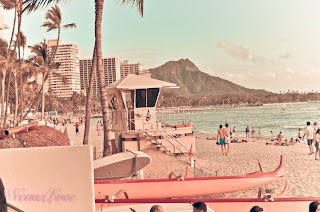 a photo I vintaged with the iconic Diamond Head. Sean Na'auao and his band. it could be any era in Waikiki's history.